Lunchtime looks a lot nicer in this design-forward to-go salad bowl. Dishes like rice bowls and last night’s leftovers look more delicious, too. The bowl is easy on the eyes and on the earth. 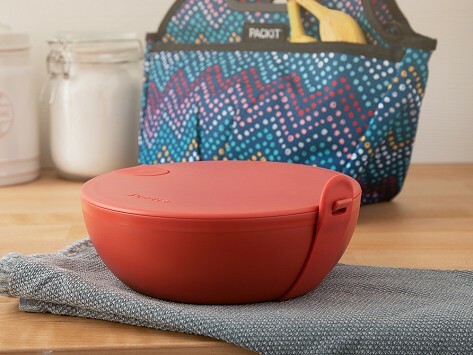 It’s crafted from BPA-free plastic with a snap-tight silicone strap that keeps the lid connected. Look at you, elevating your everyday eating experience while helping reduce waste. Dimensions: 7.5" x 7.5" x 2.88"
Very nice bowls. Too pricey really. I love the kids. They do get very warm in microwave. Heavy too. I bought one of these bowls and liked it enough to buy another. Have been completely happy with them until I used one in the microwave for the first time tonight. I let it run for 2 minutes and when I came back to it, the lid had collapsed into the bowl at an angle that caused it to be stuck. No matter my effort, I couldn't remove the lid. Finally, I was able to insert a knife blade deeply enough to release the suction and got the lid off. However, now the lid seems to be permanently warped.